Khartoum (/kɑːrˈtuːm/; kar-TOOM) (Arabic: ٱلْخَرْطُوم‎, translit. Al-Kharṭūm) is the capital and largest city of Sudan. It is located at the confluence of the White Nile, flowing north from Lake Victoria, and the Blue Nile, flowing west from Ethiopia. The location where the two Niles meet is known as "al-Mogran" (المقرن; English: "The Confluence"). The main Nile continues to flow north towards Egypt and the Mediterranean Sea. The origin of the word "Khartoum" is uncertain. One theory argues that khartoum is derived from Arabic khurṭūm (خرطوم trunk or hose), probably referring to the narrow strip of land extending between the Blue and White Niles. Dinka scholars argue that the name derives from the Dinka words "Khar-tuom" (Dinka-Bor dialect) or "Khier-tuom" as is the pronunciation in various Dinka Diaelects. These translate to a "place where rivers meet". This is supported by historical accounts which place the Dinka homeland in central Sudan (around present-day Khartoum) as recently as the 13th-17th centuries A.D. Captain J.A. Grant, who reached Khartoum in 1863 with Captain Speke's expedition, thought the name was most probably from the Arabic qurtum (قرطم safflower, i.e., Carthamus tinctorius), which was cultivated extensively in Egypt for its oil to be used as fuel. Some scholars speculate that the word derives from the Nubian word, Agartum ("the abode of Atum"), the Nubian and Egyptian god of creation. Other Beja scholars suggest "Khartoum" is derived from the Beja word, Hartoom ("meeting"). Additionally, the dream-interpreting magicians in Genesis 41:8 are referred to as חַרְטֻמֵּ֥י מצרים ("Khartoumay Miṣrayim" - Magicians of Egypt). There is some speculation that they learned their craft at an academy in the south of Egypt from which the city takes its name. In 1821, Khartoum was established 24 kilometres (15 mi) north of the ancient city of Soba, by Ibrahim Pasha, the son of Egypt's ruler, Muhammad Ali Pasha, who had just incorporated Sudan into his realm. Originally, Khartoum served as an outpost for the Egyptian Army, but the settlement quickly grew into a regional centre of trade. It also became a focal point for the slave trade. 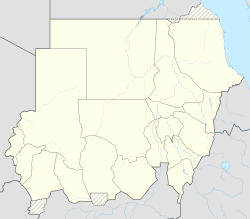 Later, it became the administrative center of Sudan and official capital. On 13 March 1884, troops loyal to the Mahdi Muhammad Ahmad started a siege of Khartoum, against defenders led by British General Charles George Gordon. The siege ended in a massacre of the Anglo-Egyptian garrison when on 26 January 1885 the heavily-damaged city fell to the Mahdists. On 2 September 1898, Omdurman was the scene of the bloody Battle of Omdurman, during which British forces under Herbert Kitchener defeated the Mahdist forces defending the city. In 1973, the city was the site of an anomalous hostage crisis in which members of Black September held 10 hostages at the Saudi Arabian embassy, five of them diplomats. The US ambassador, the US deputy ambassador, and the Belgian chargé d'affaires were murdered. The remaining hostages were released. A 1973 United States Department of State document, declassified in 2006, concluded: "The Khartoum operation was planned and carried out with the full knowledge and personal approval of Yasser Arafat." In 1977, the first oil pipeline between Khartoum and the Port of Sudan was completed. Throughout the 1970s and 1980s, Khartoum was the destination for hundreds of thousands refugees fleeing conflicts in neighboring nations such as Chad, Eritrea, Ethiopia, and Uganda. Many Eritrean and Ethiopian refugees assimilated into society, while others settled in large slums at the outskirts of the city. Since the mid-1980s, large numbers of refugees from South Sudan and Darfur fleeing the violence of the Second Sudanese Civil War and Darfur conflict have settled around Khartoum. In 1991, Osama bin Laden purchased a house in the affluent al-Riyadh neighborhood of the city and another in Soba. He lived there until 1996, when he was banished from the country. 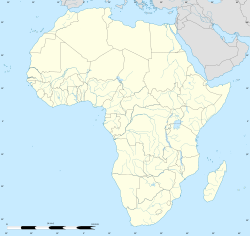 Following the 1998 U.S. embassy bombings, the United States accused bin Laden's al-Qaeda group and, on 20 August, launched cruise missile attacks on the al-Shifa pharmaceutical factory in northern Khartoum. The destruction of the factory produced diplomatic tension between the U.S. and Sudan. The factory ruins are now a tourist attraction. In November 1991, the government of President Omar al-Bashir sought to remove half the population from the city. The residents, deemed "squatters", were mostly southern Sudanese who the government feared could be potential rebel sympathizers. Around 425,000 people were placed in five "Peace Camps" in the desert an hour's drive from Khartoum. The camps were watched over by heavily armed security guards, many relief agencies were banned from assisting, and "the nearest food was at a market four miles away, a vast journey in the desert heat." Many residents were reduced to having only burlap sacks as housing. The intentional displacement was part of a large urban renewal plan backed by the housing minister, Sharaf Bannaga. The sudden death of SPLA head and vice-president of Sudan, John Garang, at the end of July 2005, was followed by three days of violent riots in the capital. The riots finally died down after Southern Sudanese politicians and tribal leaders sent strong messages to the rioters. The situation could have been much more dire; even so, the death toll was at least 24, as youths from southern Sudan attacked northern Sudanese and clashed with security forces. On 10 May 2008, the Darfur rebel group, Justice and Equality Movement, moved into the city, where they engaged in heavy fighting with Sudanese government forces. Their soldiers included minors, and their goal was to topple Omar al-Bashir's government, though the Sudanese government succeeded in beating back the assault. On 23 October 2012, an explosion at the Yarmouk munitions factory killed two people and injured another person. The Sudanese government has claimed that the explosion was the result of an Israeli airstrike. Khartoum is located in the middle of the populated areas in Sudan, at almost the northeast center of the country between 15 and 16 degrees latitude north, and between 31 and 32 degrees longitude east. Khartoum marks the convergence of the White Nile and the Blue Nile, where they join to form the bottom of the leaning-S shape of the main Nile (see map, upper right) as it zigzags through northern Sudan into Egypt at Lake Nasser. Khartoum is relatively flat, at elevation 385 m (1,263 ft), as the Nile flows northeast past Omdurman to Shendi, at elevation 364 m (1,194 ft) about 101 miles (163 km) away. Under Köppen's climate classification system, Khartoum features a hot arid climate, with only the summer months seeing noticeable precipitation. The city averages a little over 155 millimetres (6.1 in) of precipitation per year. Based on annual mean temperatures, the city is the hottest major city in the world. Temperatures routinely exceed 40 °C (104 °F) in mid-summer. Its average annual high temperature is 37.1 °C (99 °F), with six months of the year seeing an average monthly high temperature of at least 38 °C (100 °F). Furthermore, throughout the year, none of its monthly average high temperatures falls below 30 °C (86 °F). During the months of January and February, while daytime temperatures are generally very warm, nights are relatively cool, with average low temperatures just above 15 °C (59 °F). After the signing of the historic Comprehensive Peace Agreement between the government of Sudan and the Sudan People's Liberation Movement (SPLA), the Government of Sudan began a massive development project. In 2007, the biggest projects in Khartoum were the Al-Mogran Development Project, two five-star hotels, a new airport, Mac Nimir Bridge (finished in October 2007) and the Tuti Bridge that links Khartoum to Tuti Island. In the 21st century, Khartoum developed based on Sudan's oil wealth (although the independence of South Sudan in 2011 affected the economy of Sudan negatively). The center of the city has tree-lined streets. Khartoum has the highest concentration of economic activity in the country. This has changed as major economic developments take place in other parts of the country, like oil exploration in the South, the Giad Industrial Complex in Al Jazirah state and White Nile Sugar Project in Central Sudan, and the Merowe Dam in the North. Among the city's industries are printing, glass manufacturing, food processing, and textiles. Petroleum products are now produced in the far north of Khartoum state, providing fuel and jobs for the city. One of Sudan's largest refineries is located in northern Khartoum. The Souq Al Arabi is Khartoum's largest open air market. The "souq" is spread over several blocks in the center of Khartoum proper just south of the Great Mosque (Mesjid al-Kabir) and the minibus station. It is divided into separate sections, including one focused entirely on gold. Al Qasr Street and Al Jamhoriyah Street are considered the most famous high streets in Khartoum State. Afra Mall is located in the southern suburb Arkeweet. The Afra Mall has a supermarket, retail outlets, coffee shops, a bowling alley, movie theaters, and a children's playground. In 2011, Sudan opened the Hotel Section and part of the food court of the new, Corinthia Hotel Tower. The Mall/Shopping section is still under construction. Khartoum is the main location for most of Sudan's top educational bodies. In Khartoum, the capital of Sudan, there are four main levels of education. First: kindergarten and day-care. It begins in the age of 3-4, consists of 1-2 grades, (depending on the parents). Second: elementary school. the first grade pupils enter at the age of 6-7 .and It consists of 8 grades, each year there is more academic efforts and main subjects added plus more school methods improvements. By the 8th grade a student is 13–14 years old ready to take the certificate exams and entering high school. Third: upper second school and high school. At this level the school methods add some main academic subjects such as chemistry, biology, physics, geography, etc... there are three grades in this level. The students ages are about 14-15 to 17-18. Higher Education: there are many universities in Sudan such as the university of Khartoum. Some foreigners attend universities there, as the reputation of the universities are very good and the living expenses are low compared to other countries. The education system in Sudan went through many changes in the late 1980s and early 1990s. Khartoum American School, KAS, established in 1957. Khartoum International preparatory school (KIPS)|Khartoum International preparatory school, established in 1928. Khartoum is home to the largest airport in Sudan, Khartoum International Airport. It is the main hub for Sudan Airways, Sudan's main carrier. The airport was built at the southern edge of the city; but with Khartoum's rapid growth and consequent urban sprawl, the airport is currently located in the heart of the city. A new international airport is currently being built about 40 km (25 mi) south of the city center. There have been delays to start construction because lack of funding of the project but it is expected that the airport will be completed sometime in 2018. It will replace the current airport in Khartoum as Sudan's main airport. Ebeid Khatim Road, one of the largest streets of Khartoum starts from the end of the armed forces Bridge and ends at the International University of Africa going from north to south and vice versa. Amarat District 15th Street junction with Mohamed Naguib Street, one of the largest street intersections in Khartoum. Architecture of Khartoum cannot be identified by one style or even two styles; it is as diverse as its culture, where 597 different cultural groups meet. In this article are 10 buildings of Khartoum to showcase this diversity in buildings’ shapes, materials, treatments. Sudan was home to numerous ancient civilizations, such as the Kingdom of Kush, Kerma, Nobatia, Alodia, Makuria, Meroë and others, most of which flourished along the Nile. During the pre-dynastic period Nubia and Nagadan Upper Egypt were identical, simultaneously evolved systems of Pharaonic kingship by 3300 BC. The largest museum in all of Sudan is the National Museum of Sudan. Founded in 1971, it contains works from different epochs of Sudanese history. Among the exhibits are two Egyptian temples of Buhen and Semna, originally built by Queen Hatshepsut and Pharaoh Tuthmosis III, respectively, but relocated to Khartoum upon the flooding of Lake Nasser. The Republican Palace Museum, opened in 2000, is located in the former Anglican All Saints' cathedral on Sharia al-Jama'a, next to the historical Presidential Palace. The Ethnographic Museum is located on Sharia al-Jama'a, close to the Mac Nimir Bridge. 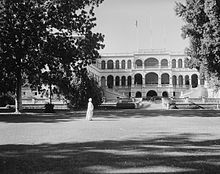 Khartoum is home to several clubs such as the Blue Nile Sailing Club, the German Club, the Greek Hotel, the Coptic Club, the Syrian Club and the International Club. There are also two football clubs situated in Khartoum – Al Khartoum SC and Al Ahli Khartoum. ^ a b "Where is Khartoum, The Sudan?". worldatlas.com. 2018. Retrieved 28 January 2018. ^ "Sudan Facts on Largest Cities, Populations, Symbols - Worldatlas.com". www.worldatlas.com. 7 April 2017. Retrieved 9 February 2018. ^ Demographia World Urban Areas (PDF) (14th ed.). Demographia. April 2018. p. 66. Retrieved 25 May 2018. ^ Beswick, Stephanie (2013). Sudan's Blood Memory: The Legacy of War, Ethnicity, and Slavery in Early South Sudan. p. 39. ^ Room, Adrian (2006). Placenames of the World (2nd ed.). McFarland. p. 194. ISBN 0-7864-2248-3. ^ Walkley, C. E. J. (1935). "THE STORY OF KHARTOUM" [2017-01-01]. Sudan Notes and Records. University of Khartoum. 18 (2): 221–241. doi:10.2307/41710712. JSTOR 41710712. ^ "Beja scholars and the creativity of powerlessness". Passages. University of Michigan Library. ^ Hasan Shukri (August 1966). "Khartoum and Tuti 'Shreen Munz Qarnan". Khartoum. 1 (11): 23. ^ Hammond, Peter (2005). Slavery, Terrorism & Islam. Cape Town, South Africa: Christian Liberty Books. ^ "The Seizure of the Saudi Arabian Embassy in Khartoum" (PDF). U.S. Department of State. Archived from the original (PDF) on 16 December 2006. Retrieved 28 January 2014. ^ 1966-, Peterson, Scott, (2000). Me against my brother : at war in Somalia, Sudan, and Rwanda : a journalist reports from the battlefields of Africa. New York: Routledge. ISBN 0415921988. OCLC 43287853. ^ "Khartoum Squatters Forcibly Displaced". Christian Science Monitor. 31 March 1992. ISSN 0882-7729. Retrieved 21 March 2019. ^ Miller, Judith (9 March 1992). "Sudan Is Undeterred in Drive to Expel Squatters". The New York Times. ISSN 0362-4331. Retrieved 21 March 2019. ^ "World | Africa | Riots after Sudan VP Garang dies". BBC News. 1 August 2005. Retrieved 27 June 2010. ^ "Curfew in capital as Sudanese army clash near Khartoum with Darfur rebels". Sudan Tribune. 10 May 2008. ^ "Sudanese rebels 'reach Khartoum'". BBC News. 10 May 2008. ^ "PHOTOS: Sudan capital after today's attack from Darfur JEM". Sudan Tribune. 10 May 2008. ^ a b "Khartoum Elevation (385m)". distancesto.com. 2018. Retrieved 28 January 2018. ^ "Shendi Elevation (364m)". distancesto.com. 2018. Retrieved 28 January 2018. ^ "World Weather Information Service – Khartoum". World Meteorological Organization. Retrieved 6 May 2010. ^ "Khartoum Climate Normals 1961–1990". National Oceanic and Atmospheric Administration. Retrieved 16 January 2014. ^ "Klimatafel von Khartoum / Sudan" (PDF). Baseline climate means (1961-1990) from stations all over the world (in German). Deutscher Wetterdienst. Retrieved 22 October 2016. ^ "Sudan and UNDP launch Millennium Goals project". Sudan Tribune. 5 September 2005. Retrieved 28 June 2008. ^ Winter, Joseph (24 April 2007). "Khartoum booms as Darfur burns". BBC. Retrieved 28 June 2008. ^ a b "Country Analysis Brief: Sudan and South Sudan" (PDF). US Energy Information Administration. 3 September 2014. pp. 13–14 Oil refineries. Retrieved 14 July 2010. ^ "Sudan Shopping and Districts (Sudan, SD, North-East Africa)". World Guides. TravelSmart Ltd. 7 June 2016. Retrieved 14 July 2017. ^ "وزارة تعليم عالي والبحث العلمي". حكومة سودان. Retrieved 25 May 2018. ^ "وزارة التربية والتعليم". حكومة سودان. Retrieved 25 May 2018. ^ null (24 January 2012). The Status of the Education Sector in Sudan. The World Bank. pp. 159–189. doi:10.1596/9780821388570_ch07 – via elibrary.worldbank.org (Atypon). ^ "britisheducationsudan.com". britisheducationsudan.com. Archived from the original on 17 May 2014. Retrieved 20 May 2014. ^ http://about.me/msaif30, MSaif / Original design: NVS Sudan -. "Nile Valley School - NVS in Brief". www.nilevalleyschool.com. Archived from the original on 20 March 2018. Retrieved 25 May 2018. ^ "Sudanese higher education". Ministry of Higher Education & Scientific Research. Retrieved 15 September 2011. ^ "Universities of Sudan Ahfad university for women". Consejo Superior de Investigaciones Científicas. Archived from the original on 19 March 2012. Retrieved 15 September 2011. ^ "Archnet". archnet.org. Archived from the original on 7 October 2012. ^ Shumba, Ano (28 October 2015). "Sudan National Museum ; Bio". Music in Africa. Retrieved 14 July 2017. ^ "The Rescue of Nubian Monuments and Sites". UNESCO. 2017. Retrieved 14 July 2017. ^ "Palace Museum". Presidency of the Republic of Sudan. 2016. Archived from the original on 7 July 2017. Retrieved 14 July 2017. ^ "Designs for the Cathedral Church of All Saints, Khartoum..." RIBApix. 2017. Retrieved 14 July 2017. ^ "Museums In Sudan". The Embassy of the Republic of Sudan. Retrieved 13 July 2017. ^ Jibreel, T. J. O. (2010). "2 - Materials and Methods, Site of collection" (PDF). Two Ichneumonid Parasitoid Wasps Affecting Ficus sycamorus (L.) Fruits in Khartoum State (Thesis). Khartoum, Sudan: University of Khartoum department of Zoology. pp. 20–22. ^ Uloth, Tony (18 January 2011). "The Blue Nile Sailing Club". The Melik Society. Retrieved 13 July 2017. ^ "Reuters.com". Africa.reuters.com. 9 February 2009. Archived from the original on 1 February 2013. Retrieved 20 May 2014. ^ "Night clubs in Khartoum city". Fortune of Africa. Retrieved 13 July 2017. ^ "Former Ghana coach Kwesi Appiah takes over at SC Khartoum". BBC Sport. 17 December 2014. Retrieved 14 July 2017. ^ "Al Ahli Khartoum". FIFA (International Federation of Association Football). May 2017. Retrieved 14 July 2017. ^ "İstanbul'un Kardeş Şehir, İşbirliği Protokolleri ve Mutabakat Zaptı/İyi Niyet Mektupları" [Istanbul's Sister Cities, Cooperation Protocols and Memorandum of Understanding/Goodwill Letters] (in Turkish). İstanbul Büyükşehir Belediyesi. Retrieved 1 June 2015. ^ "Sister Cities of Istanbul". Istanbul. 2016. Retrieved 21 October 2016. ^ "Ethiopia's Capital Addis Ababa and Khartoum sign twin cities agreement". Nazret. 26 September 2010. Retrieved 21 October 2016. ^ "Brasilia Global Partners". Internacional.df.gov.br. Archived from the original on 28 February 2014. Retrieved 13 July 2017. ^ "Sister Cities". Wuhan University. 2016. Archived from the original on 15 October 2016. Retrieved 21 October 2016. Wikivoyage has a travel guide for Khartoum.